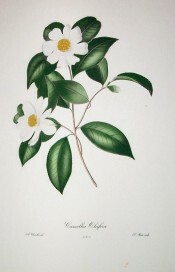 Hortus Camdenensis | Camellia oleifera Abel. Fully-hardy, small, erect tree with slender branches and elliptic or obovate leaves and scented, single white flowers in autumn. To 7m by 4m. [RHSE]. Introduced to Europe in 1811. [Hilliers’]. The Botanical Register gives its date of introduction as 1820, by Captain Nesbitt, and states that it was this introduction ‘from which, and subsequent importations of the (Horticultural) Society, all the plants now in the country have been derived.’ [BR f.942/1826]. ‘According to Dr. Abel, the Chinese cultivate it largely for the nuts, from which they obtain sweet oil of a very excellent quality. It grows to the size of a cherry tree, and bears in great profusion.’ [LBC no.1065, 1825]. ‘A very tall shrub, pyramidal; leaves ovate-oblong, slightly crenate, flat; flowers biternate, white, single, rather large. From the fruit of this shrub, the Chinese extract an oils of a sweet odor, with which they perfume their apartments.’ [Berlèse Monography p.49/1838]. Chandler pl.3/1831. Listed in the 1843 and 1845 catalogues only.